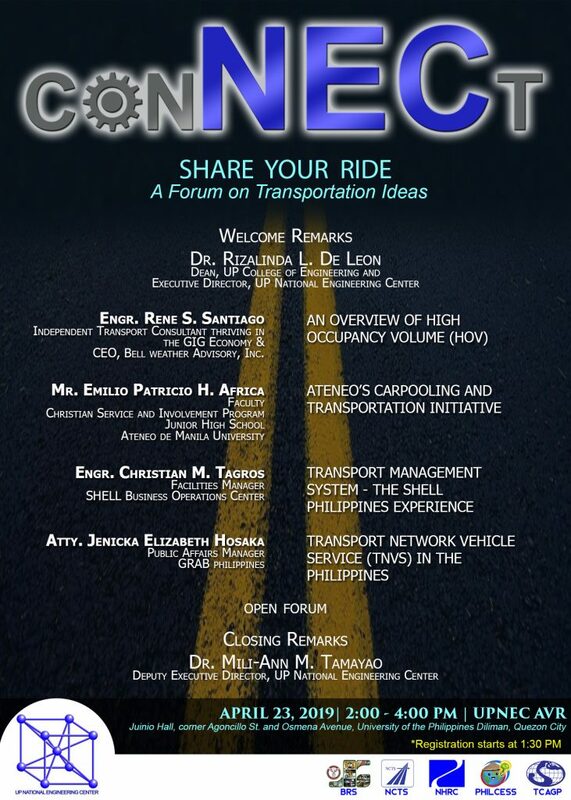 The University of the Philippines National Engineering Center (UP NEC) would like to invite you to ConNECt: SHARE YOUR RIDE A Forum on Transportation Ideas on 23 April 2019 (Tuesday), 2:00 – 4:00 PM at the Audio-Visual Room, Ground Floor, UP NEC. ConNECt aims to showcase scientific projects, research works, and accomplishments in the field of engineering, in this case, on Transportation. The symposium also aims to raise awareness on the value of engineering and science and their critical roles in improving the quality of life of ordinary people. ConNECt will be using the presentation format of TED-type talk that is short, concise and idea-focused, provokes conversations that matter, and fosters learning, inspiration and wonder. This activity is open to the public. For queries, you may reach us through the UP NEC Engineering Information and Marketing Division at (02) 981-8500 local 3006 and 3008 or (02) 927-1581. We are looking forward to your positive response to our invitation!